“Ah, yes,” a 12-year-old girl stopped cycling to reply to a question from a stranger after he asked her for directions. “Could I talk with you for awhile? I’m in search of a group of children who could share me a story,” the stranger continued the dialogue, but swiftly changed to another unanticipated topic. “Sure, but what are we going to talk about though?” The short answer from the girl made him smile from ear to ear. “Just anything you wish; as you live at the bank of the Mekong river, your stories are all appreciated!” he promptly replied. “Yes, of course,” the guy was thrilled to bits once he heard the question which was also in his mind. From your left hand side: Amy, Korn, Pop, Noey and June. Actually, I was the guy in the above dialogue with a girl whom I accidentally met on the small lane alongside the Mekong River in the town of Phonpisai. 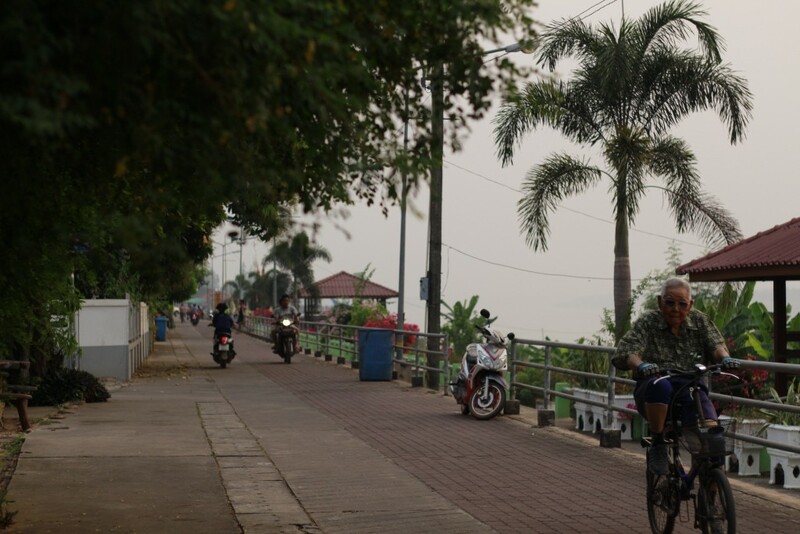 After my first day was hopefully (but later hopelessly) spent in the downtown of Nongkhai, roughly observing residents of the town to find out what should be brought to you as a story about the international river Mekong, I had no idea what should be written at the moment. Whereas information about the Mekong is nowadays really accessible (especially scholarly articles), only a few stories of ordinary children’s perspectives towards the river could be found on the internet, in particular those written by young people. In the morning I went to the pier next to Thasadet,the first Indochina market in Thailand, just to let a story come to my mind. Standing next to the river, witnessing its level sharply raised as the result of China’s dam release a couple of days ago, I was thinking of my childhood when I was young. I was born and raised in a rural area of the northeastern Thailand where at least 8 hours of travel is needed for locals to experience the nearest sea beach. Among the very limited places where my family could afford as a vacation destination, Nongkhai was the first and only place that we visited together as a family, in particular when my grandfather was with us. My hometown is not situated at the bank of the river;it takes 3 hours to travel there. No matter where a village is located, as long as it is a home to Lao community I am sure there is a story about the Mekong. We are all tightly connected – historically and spiritually – with the great river, as we have been for hundreds of years. In this fashion, my grandfather shared various stories with me that are linked to the Mekong. Some were repeatedly told, but they were all enjoyable for a child like me. Instead of sharing my own stories, those brought to me by my loving grandfather, it is all in all much better to explore the more lively stories that are possessed by the children of today. On an ordinary but super sunny afternoon, once my identity card was left as required at a bike rental shop, I grabbed a motorbike which was my only companion on the way to Phonpisai(40 kilometers from the heart of Nongkai), one of the Mekong towns in the Northeastern part of Thailand. As aforementioned, I was almost hopeless until I witnessed the flow of the river in the morning, at the point where I had been with my grandpa years ago, and was reminded of some of stories about the Mekong that were told by him when I was young. Hence my hope was rebooted, and any group of children was a target as my key informants. Phonpisai was chosen based on the fact that I wanted to explore an unfamiliar town, and it met this simple requirement of mine. My only knowledge about the town was that it is the best spot for tourists to be enchanted by the mysterious beauty of Naga fireballs. Amy, the girl whom I met at first, dropped by each house to wait for and invite her friends. A girl named Pop and Korn,the youngest and only boy, didn’t believe that an outsider wanted to talk with them about their lives and the river. “Excuse me bro, please come with me to tell my friend that you are really here with us,” June asked me after she came back from Pop’s house. Finally, I had five of them together sitting under the big tree, in a temple that’s provided villagers and visitors shelter for years next to the Mekong River, and everything was ready to begin. “Come a little bit closer,” I told them. Some background of mine was given. Their consent to be interviewed and to publish their stories as well as their photos was granted. “Yes, this is my first time to be interviewed but my grandma was interviewed before, maybe you could talk to her also”, Noey informed me as I continued to learn more about their backgrounds. “She was asked about Naga fireballs,” she added. I replied to the girl, as she encouraged me to interview her grandmother, that talking with children just like them is expectedly and ideally enough for me, so there was no need to talk to her grandmother. None of them looked nervous, everyone seemed so happy to be interviewed. “Where is the river from?” “Do you know what countries people can see the river from?” I asked them. Nobody could tell me where the origin of the river is, at first glance. “Laos, Thailand, and…”, Pop gave me her answers, followed by June’s, “China,” and Korn’s, “Myanmar.” “Cambodia,” Noey added. The others laughed out loud, as they did not think her answer was correct. What if somebody in Bangkok has never been to the river before, could you please help them to imagine the Mekong River? I challenged them. “Any of you really know how to swim?” I gave them a very simple question, but it seemed that it brought silence to the place for a minute. They were not sure if they could swim correctly. Actually, they all informed me that it’s common for children there to be warned not to swim, just in case no one is with them. However, their families used to bring them to the river. “In dry season, there is the so-called beach and everybody loves it,” June said. Pop told me that with a raft made of big bamboos, children could enjoy the river. Korn was the only one who has never been instructed to avoid swimming but still he has never swum, up until now at the age of 10. June said that the number of the fireballs has decreased year after year. “It is because people light fireworks, and this disrupts those Naga; last year I saw only 22 fireballs here,” Noey forwarded the idea of her grandmother as well as her experience to us. “I think I was at another spot, like in Pakkad, another district,” June commented. At the End of Buddhist Lent day thousands of tourists, both Thai and foreigners, flow into Ponpisai and other spots along the river to experience the fireballs. These young children believe that the fireball shooting is a part of Naga’s celebration; even though none of them have seen the Naga which are, as they have heard, not scary, but powerful and huge and very kind snakes, the protectors of the people living along the river. “Probably, Naga is with us in our community, some of us may have seen but not noticed that it was Naga because it can turn itself into a human just like us,” June pointed out her assumption. Amy actively shared, “once, I saw a man jump into the river and even though I was at the riverside until the evening, I didn’t see him get out of the water.” Her story looked so powerful in enchanting the audiences. “He may be a Naga though,” she concluded. “My favorite thing in the festival is the firework itself,” June replied to me. “Mine is all about food, I do love food,” Pop shared hers. “I like travelers,” after listening to others’ answers for a while, Korn also shared his point. “Yes, my mom was so happy because she could earn a lot of money from selling food and snacks on the day,” Pop interrupted. “Springboard and roller coaster are my favorite part of the festive,” Amy said. As you can see, it is so outstanding that everyone loves the festival and really enjoys the day. Aside from the festival, in the other 364 days all year round, everyone is invited to visit their hometown. I asked them to share some places to visit or activities that outsiders should never miss. Wat thai, a human-made Naga cave, having dinner and a decent stay at the river’s bank, and sightseeing were all recommended. Additionally, in order to be a good tourist you should, as told by these boys and girls, make sure your garbage always ends up in a trash can, learn how to greet appropriately, visit as many places as you can, talk politely, don’t leave any message on the pavilions, and don’t throw anything into the Mekong River. “The polluted water we used and left into the river shall always find their ways turn back to our lives somehow,” Pop started a new topic. Noey jointly contributed, “thus we should save water, always turn off the faucet.” Amy agreed with her friend on this point. Korn suggested that we should pay more attention to those toxic and chemical substances; they are very bad for our river. These were their answers to my question of what a child can do to save the river. It’s undeniable that some remembrances of one’s childhood could lead to unexplainable happiness whenever it comes to mind. Through the hour-long chatting with a group of children, not an interview with an expert or activist, you can feel the attachment between lives and the river, the memories of these boys and girls. In addition to those scientific studies and other academic perspectives, I hope these children’s ordinary and simple stories can help you to re imagine how real the significance of the Mekong River’s existence is. Just imagine if the beautiful and peaceful Mekong River is replaced by hundreds of dam or runs dry forever. It will really be regretted because there is a linkage between the river and my remembrance of my grandfather. It was the only place we went together, and it was chosen by him before he passed away to be his last home, through scattering his ashes over it. Whenever I miss him, I wish I could turn to the riverside of the Mekong River, which is the origin of deep bounds of affection and impressions for millions of people in the region, including me.